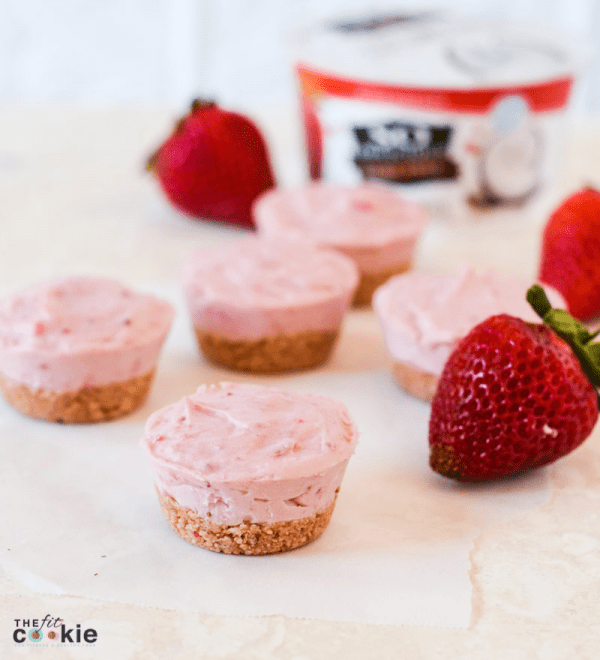 These delicious Mini Dairy Free Strawberry Cheesecakes are the perfect gluten free and no-bake cheesecake: easy to make, perfect portion sizes, fresh strawberry taste, and no artificial flavors or colors! So when the weather finally does warm up for real, we soak up the sun and outdoors as much as possible! 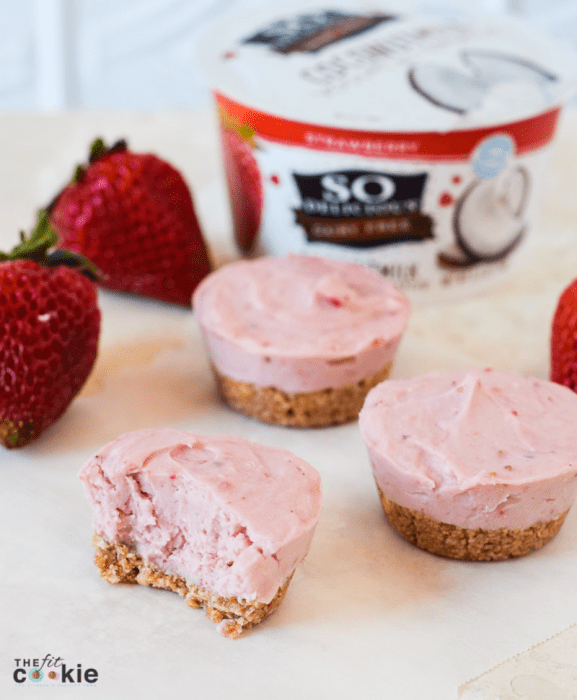 And we love to make fruity desserts to celebrate warmer weather, like these amazing Mini Dairy Free Strawberry Cheesecakes. Since they are no bake, you can make these even when the weather is hot in the middle of summer. 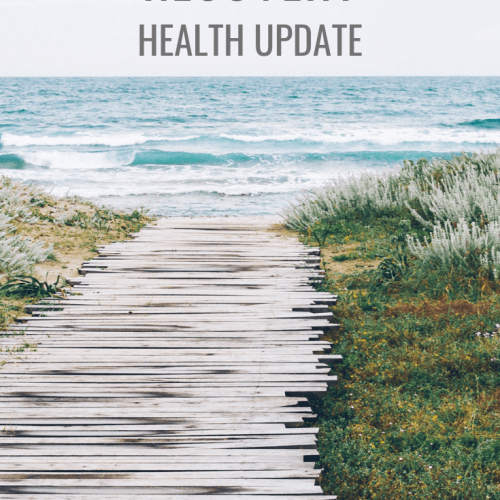 Back when I was a pre-teen, we discovered that I was allergic to milk, so we gradually removed dairy from my diet until I was completely dairy free. One of the things that I had missed about eating dairy free for 20+ years was the creamy and decadent desserts. But thanks to companies like So Delicious, my kids and I don’t have to miss out on cool and creamy treats! 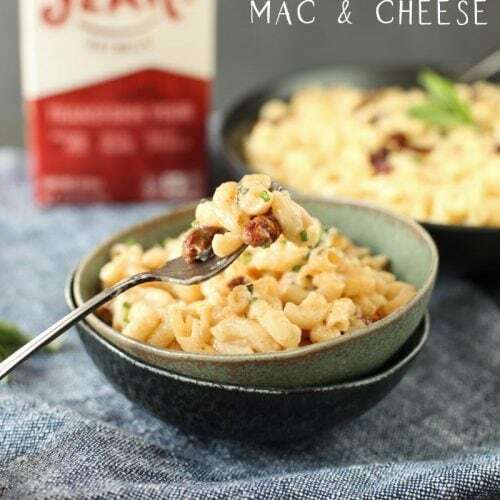 So Delicious is making it easier to live with dairy allergies, or just avoid dairy if you choose not to eat it. With products like CocoWhip (which my whole family loves! ), their coconutmilk yogurt alternatives, and their delicious frozen desserts, you won’t miss the dairy and you can still have creamy desserts. 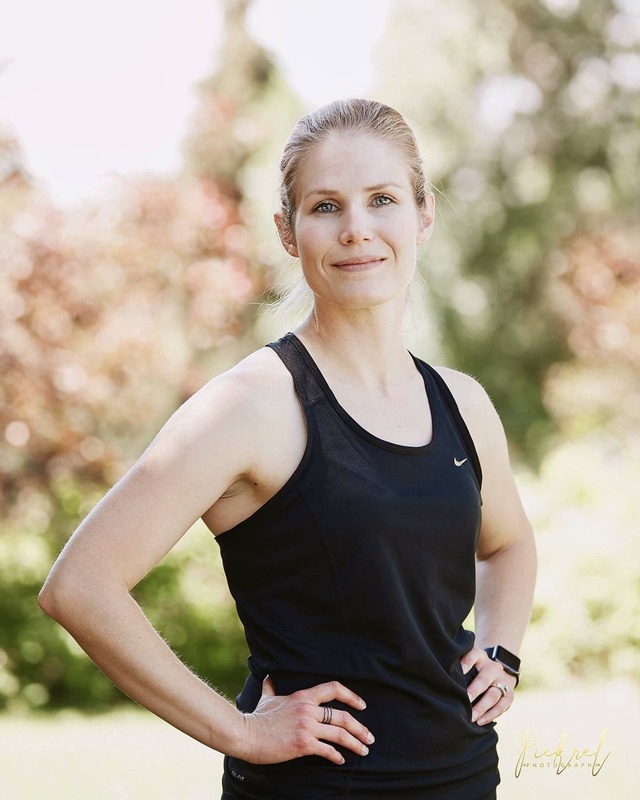 The So Delicious Coconutmilk Yogurt Alternatives are a great way to add some live, active cultures to your daily routine. My kids love the Key Lime flavor, and you can use that flavor in this recipe instead of strawberry for mini key lime cheesecakes! The Strawberry and Key Lime flavors are perfect fresh fruity flavors for Spring. The So Delicious Coconutmilk yogurt alternatives have other great flavors like Chocolate and Peach, are smooth and creamy, and have the right blend of sweet and tangy. Every flavor of their coconutmilk yogurt alternatives are made with organic coconuts and simple ingredients that are non-GMO, certified gluten-free, and certified vegan. 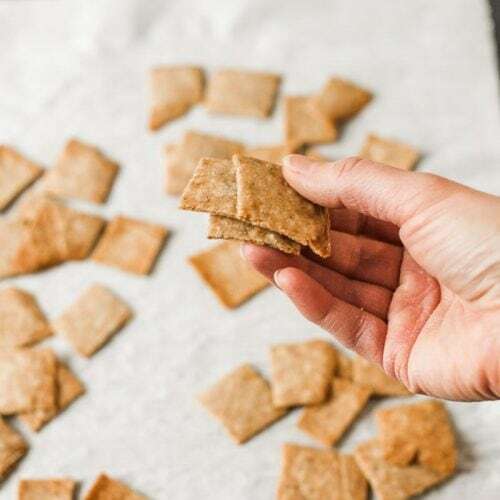 If you’re watching your sugar intake or want to use the coconutmilk yogurt alternative in a savory recipe, So Delicious also makes it in plain and unsweetened varieties as well. 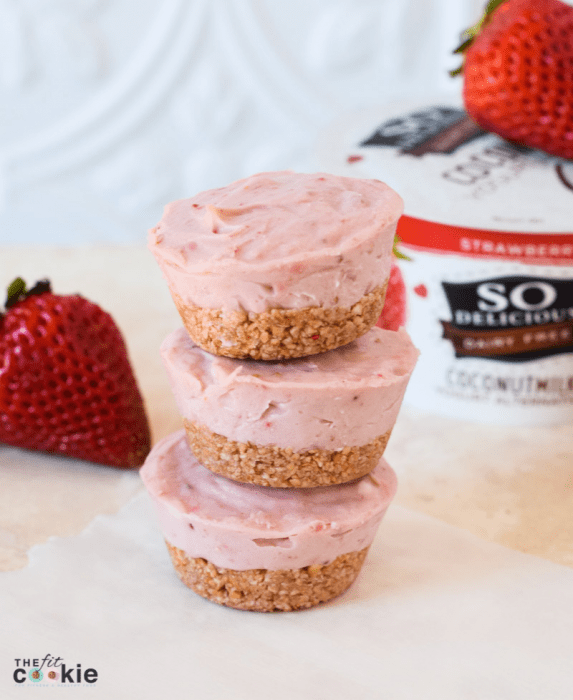 For these strawberry cheesecakes, I decided to make the crust super easy and a little healthier than a cookie-crumb crust, so I used granola for the crust. Super simple! 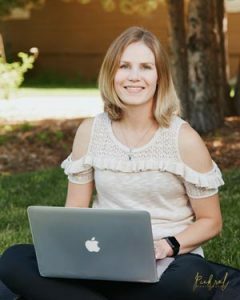 I chose a yummy nut-free strawberry granola so my kids can have it, too, but you can use any granola that you love and that fits your food allergies. When making this recipe, make sure to gradually add the coconutmilk yogurt alternative to the cream cheese so it will be blended well. If you add it all at once, it won’t blend well and will be lumpy. 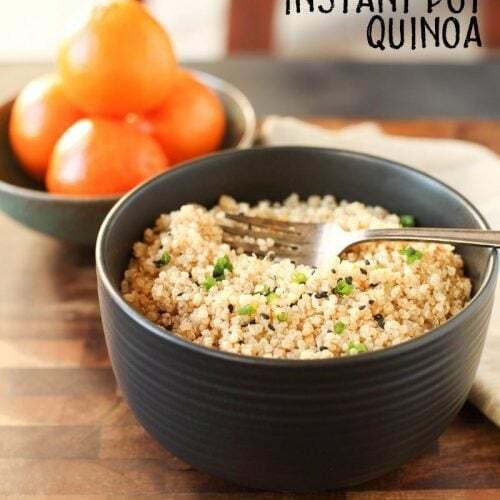 I added notes about this in the recipe card, don’t miss it! 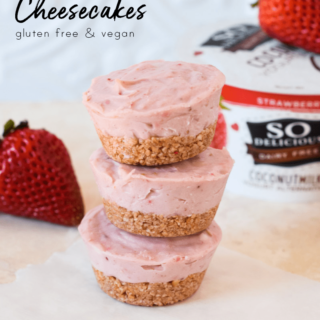 Check out our other no-bake vegan cheesecakes made without cashews! Learn more about the So Delicious Coconutmilk Yogurt Alternatives, or follow So Delicious on Facebook, Instagram, or Twitter! 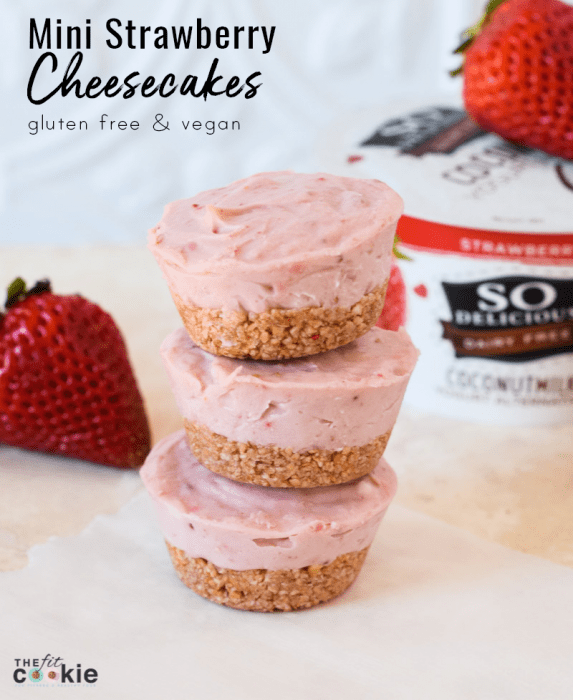 These delicious Mini Dairy Free Strawberry Cheesecakes are the perfect gluten free and vegan cheesecake, with no artificial flavors or colors! Place the granola in a small food processor and process very briefly until it is coarsely ground. Add the melted coconut oil the maple syrup to the ground granola, and mix together. Divide the granola mixture between 12 muffin wells in a silicone mini muffin pan, and press the granola mixture into the bottom of each well. Set aside while you make the filling. In a medium bowl, beat the dairy free cream cheese with a hand mixer until it’s soft. 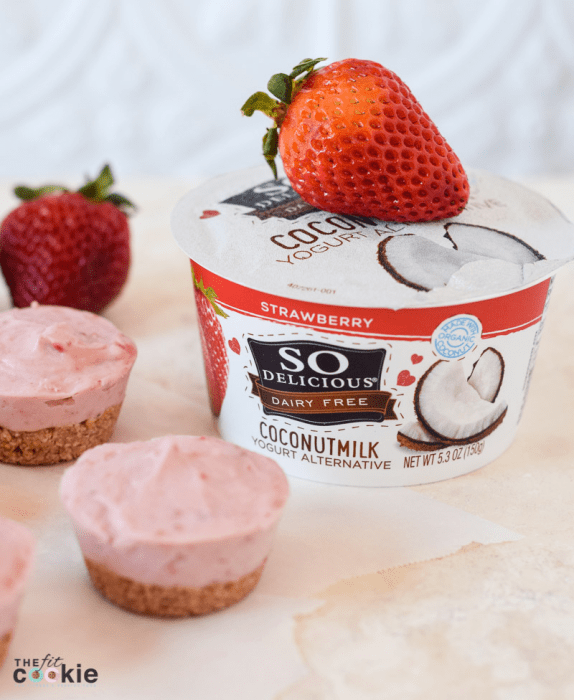 Gradually add the So Delicious Strawberry Coconutmilk Yogurt Alternative a little at a time, beating the whole time, until it is all blended and smooth. Make sure to add the yogurt gradually: if you add the yogurt all at once to the cream cheese, it will not blend well and it will be lumpy! Place the freeze-dried strawberries in a plastic bag and roll with a rolling pin until they are crushed into a strawberry powder. Add the strawberry powder, the vanilla, and the Stevia drops to the cream cheese mixture and blend again until smooth and mixed well. Add the filling to the silicone mini muffin pan on top of the granola crust, dividing it evenly among the 12 mini muffin cups and spreading out the tops to make them even and smooth. Place the silicone mini muffin pan in the freezer to set. Allow the mini cheesecakes to freeze completely (about 2 hours) so they can easily be removed from the silicone muffin pan. 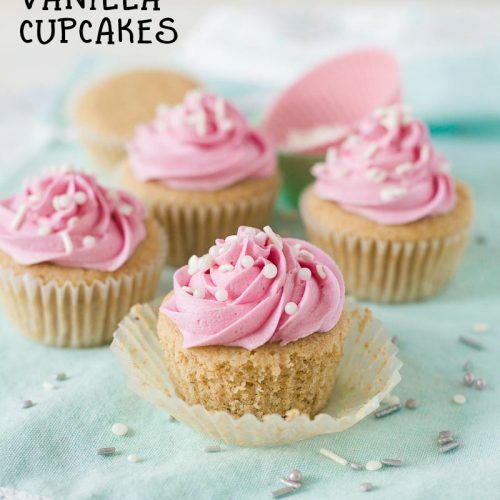 Once the mini cheesecakes are frozen completely, remove them from the silicone muffin pan and either store them in an airtight container in the fridge, OR set them out at room temp for 30-60 minutes to thaw and serve. You can top these with extra strawberries, So Delicious CocoWhip, or your favorite allergy-friendly chocolate sauce! I am new to Dairy Free, what is the best dairy free cream cheese? I already buy that yogurt just to eat daily and I absolutely love it! I want to make these for myself the next time my husband is craving cheesecake ( he eats dairy). Thanks! These are so adorable looking and almost look too good to eat! These look AMAZING. Perfect for the warm weather that is just around the corner! ah, so fresh and light – perfect for the warm sunny days we are now seeing! These have me drooling! Oh my gosh, I can’t wait to try!! You should definitely make these, they are so good! They are a pretty amazing company, can’t wait to try their new ice cream flavors! What a pretty dessert…and pretty easy! These are so adorable. I love the bite size treats that they are! We love to make fruity desserts to celebrate warm weather too! 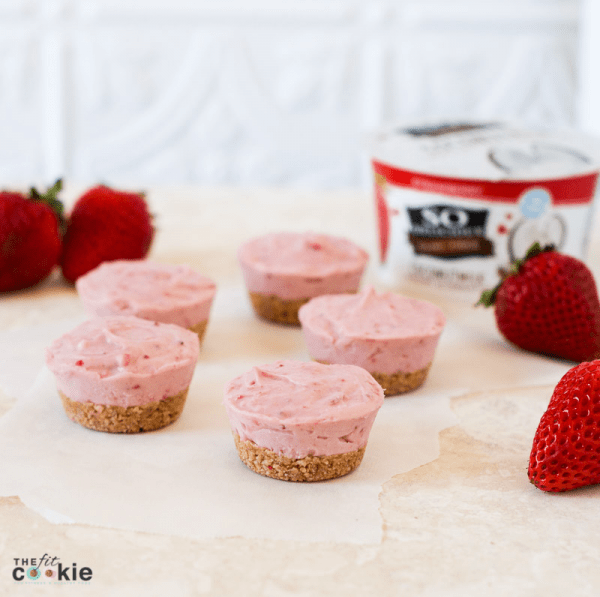 These Mini Dairy Free Strawberry Cheesecakes look like the perfect dessert to celebrate summer with. 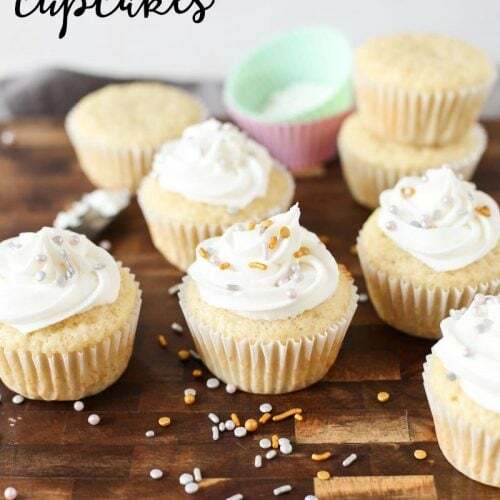 They are such a great treat for warmer weather, I can’t wait to make more flavors!